Have you ever thought about why your washing machine smells terrible? It might have something to do with the design of the device, or it may just be because your front loading or top loading washing machine is practically a breeding ground for mold and mildew. Either way, you’ll want to learn the best cleaning tips to protect your washing machine and everything that goes in it from those unwanted and unpleasant smells. Have you considered making a homemade washing machine cleaner to use in your home? To get started, you’ll want to gather ingredients like baking soda, laundry soap, and white vinegar to remove mold, mildew, unpleasant smells, and soap scum build up. You don’t have to clean your washing machine every wash cycle, but it’s a good idea to clean it every couple of weeks. The best top loading washer recipes require common household ingredients to get the job done. For this top-loading washing machine tip, you’ll need white vinegar and baking soda. The white vinegar will disinfect the machines, while the baking soda will clean soap scum off the machines and promote a fresh smell. Let your top load washer run on its hottest setting with nothing inside. Make sure the largest load setting is selected. Then, add three to four cups of white vinegar to the water and allow it to mix into the water for about one minute with the lid open. Add approximately one-half cup of baking soda and allow it to blend into the water and vinegar for another minute. Stop the water and let the cleaning solutions sit for half an hour to an hour. While the water is sitting, wipe down the inside of the washer with a cleaning rag, paying particular attention to the fabric softener dispenser. Once you’ve wiped it down, let the cleaning cycle continue until all the water drains, and you should be good to go! A front-loading washer machine needs different cleaning than a top-loading washer, but some of the same ingredients can be used. Before starting on the inside of your front load washer, begin by cleaning the rubber seal of the machine, as this area will have a buildup of hair and other unwanted particles. Then, clean the front load washing machine gaskets by spraying vinegar into the folds. Take a cleaning rag with baking soda on it and wipe down all areas. If mold or mildew is growing in between the folds, spray peroxide and scrub it with an old toothbrush. Run a rinse cycle and sprinkle baking soda into the drum of the front loading washing machine as this will help reduce unpleasant odors. Pour a cup of vinegar into the detergent dispenser and run a cleaning cycle for approximately one hour. This DIY front loader washing machine cleaner will keep your machine clean for weeks. Finding the perfect homemade washer cleaner may be challenging, but what if we told you all you need to do is use vinegar? You won’t even smell vinegar once the clean cycle has gone through entirely. Put the temperature on your washing machine to the hottest setting, most extended cycle, and largest load size. Add four cups of vinegar to the hot water, close the lid, and let the water run for a few minutes. Stop the cycle and let the vinegar water sit for about an hour before draining. Wipe down any leftover buildup with a cleaning rag or paper towel and let another rinse cycle go through if necessary. Almost everyone has a laundry room, nearly every laundry room has a washing machine, and nearly every washing machine is used every day. Instead of regularly using a homemade washing machine cleaner recipe, try limiting your recipe usage by using this tip: Wipe your machine out regularly. To save extra time, money, and effort, wipe down your machine at the end of every day. Use a dry paper towel or a dry, clean rag to wipe off any extra laundry detergent or particles sticking to the sides of your washing machine. This nifty homemade washer cleaner trick can be used for other household items, too. It is useful when cleaning your coffee pot, especially if you don’t want the brown liquid to stain the glass interior. If you wonder how to clean a dishwasher, you can start with this tip before using a homemade recipe, too. It doesn’t matter which washing machine you own when you consider that you should always take your clothes out of the washing machine once they’re clean. Don’t let your clothes sit in the washing machine, as this can quickly cause mold and mildew accumulation. Not only will the machine suffer, but the clothes will, too. If you’re trying to avoid smelly clothes, trust us on this one and get the clothes to the dryer as soon as possible. 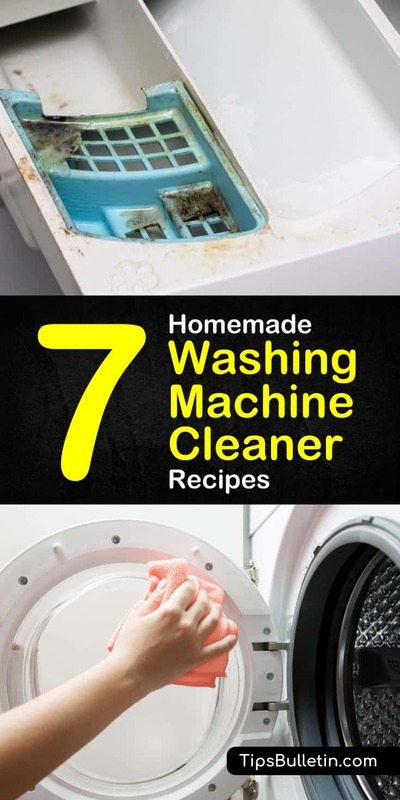 You don’t have to wash out your washing machine all the time with a homemade washing machine cleaner, but you should make sure that mold and mildew aren’t growing inside the machine. If you don’t want to use a detailed recipe all the time, try using this once-a-week trick. Combine all ingredients and pour the solution into a spray bottle. Shake the bottle well before each use and spray the seal, drum, and door of the washing machine. Let it sit for a couple of minutes, then wipe all areas down with a clean cloth. The essential oil will give your washer machine a fresh scent, and the vinegar will disinfect all areas. Be sure to let the machine air dry with the door open before washing a baseball cap, bed sheets, another batch of laundry, etc. A good deep cleaning is necessary once every few months, but you’ll want to set aside a good chunk of time to get this chore done, as it does require two full phases of cleaning to complete. Phase 1: Remove the tray dispenser inside the washing machine and soak it in hot water and dish soap. Scrub away all build up with an old toothbrush and put it back inside the machine. Pour washing soda in the drum of the machine and run your machine on its hottest setting. Phase 2: Once the cycle is complete, pour vinegar and essential oils into the liquid dispenser. Run the washer on its hottest setting again and wipe out all areas after the cycle is complete. Allow to air dry before washing another load of laundry. Keeping your washing machine clean is essential, whether you have a front loader or a top loader. When cleaning either of these machines, you’ll want to double check that you have the washer on the correct water setting, with the right water temperature (hot water, cold water, etc.). Follow the simple steps, use the proper ingredients, and you’ll be on your way to clean clothes and a clean machine. 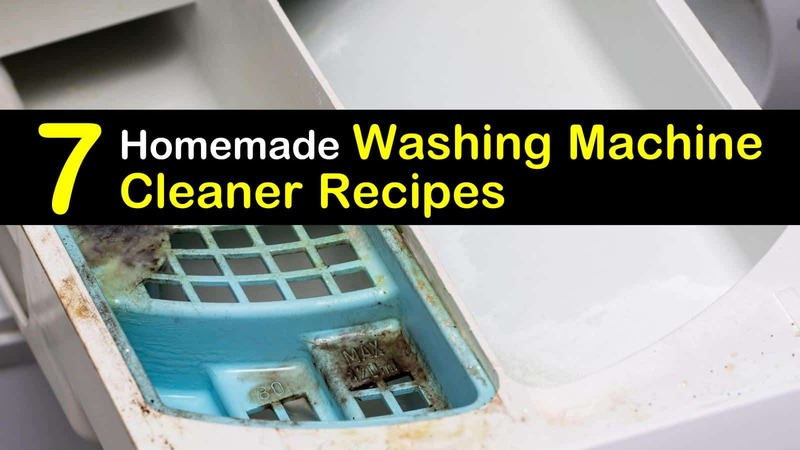 We hope you liked our DIY front loader and top loader washing machine cleaner recipes. If you enjoyed reading our washer tricks, please share these cleaning tips on Facebook with your family and friends.